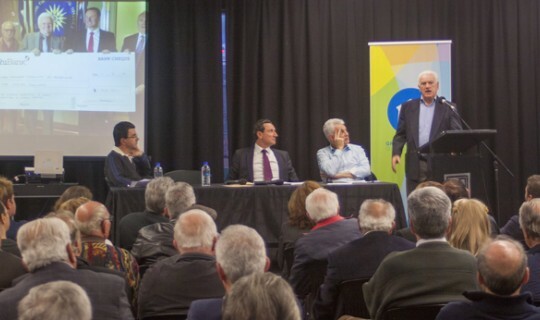 More than 70 representatives of Greek organisations participated in a special meeting organised by the Greek Community of Melbourne (GCM) at the Greek Centre, on Wednesday 14 June, to discuss issues concerning the GCM and the Greek community as a whole. Mr. Papastergiadis said that Greek organisations were established with efforts and the hard work of their members. "Our point now is not to see your hard work lost, but to recognise your achievements and see you continue to operate. We all have to look beyond our organisation and the entire community." “Our goal is to create a powerful and effective community, "said Mr Papastergiadis. "A community that can protect and promote our national and cultural interests. That is why we are asking for your co-operation. " Mr. Papastergiadis stressed that "the issues that we would like to address today are the development of the Bulleen property and a new Cultural Centre. The other important initiatives include the creation of a Club of Organizations on the third floor of the GCM, the establishment of a Greek Diaspora Department at Melbourne University, and providing GCM membership to Greek community organisations. " The Hon. General Secretary of the GCM Mr. Costas Markos, referred to the plans for further development of a Greek Centre and for new services offered by the GCM to the Greek community organisations. He also stressed that further to the investment of $15 million for building the Greek Centre "we are continuing to invest in the improvement of its services and facilities" and discussed proposed renovations to the foyer of the building, to the installation of new and modern audio-visual systems, to the transfer of the GCM offices to the 12th floor, to the transfer of the library from the Greek Consulate to the Greek Centre and to the creation of the Club of organizations on the 3rd floor, with the kind donation of the Association of Argos Orestiko. "Argos Orestiko will be able to use Level 3 and the facilities of the Greek Centre along with other organisations. We hope that the historic donation of Argos Orestiko will be followed by other community organisations, " he said. "Now we have a great opportunity to join the GCM and to assist the realisation of its vision for the future. All together we can do it," he said. Mr. Mavroudis pointed out that the GCM “has now begun giving much to the community and to the organisations."